The Itty Bitty Kitty Committee: It's Leonard's Turn! We've got ANOTHER Winkler update for you today. And here is his today! Here's what his mama, Laura, had to say! He is a BIG boy! Leonard is now about 8 months old and outweighs his brother Tiberius, who is 3. He is very, very handsome with huge eyes, a very long, soft tail and extremely soft fur. The fur around his chin and his nose area have turned a light orangey-brown color. It's really cute. He talks a lot and loves to cuddle. Tiberius is now following his lead and cuddling much more than he used to. Leonard is definitely dominant and runs the show. I knew this would be the case the moment I brought him home and he growled at Tiberius through his cat carrier. Tiberius loves to bathe him regularly and wrestle with him on a daily basis. this has gone on from day two. They both wait for me by the window everyday as I get home from work. Leonard loves food. He also loves opening cupboards. He uses his girth for momentum. ;) I will try to get a video of this. One thing that Leonard has started recently is showering. Yes. My cat showers! This has been going on for about 3 weeks. He was always interested in going between the curtains and the shower while it was on, but now he has taken the plunge and goes all the way in! 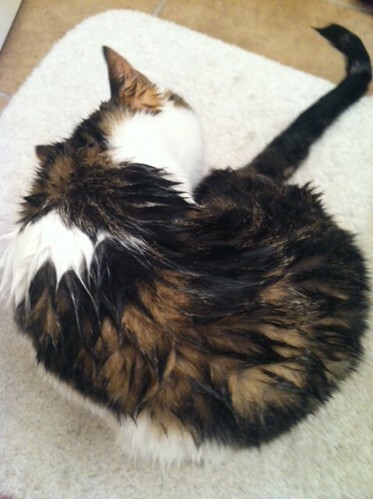 He usually swats at the water hitting the wall for a few minutes, then jumps out and finishes his daily "bath." The first time he did this I tried to dry him off and he got angry at me. Anyway, this is now our little ritual every morning. He sprints into the shower as soon as I turn it on. Afterward, he jumps back in and presses on the shower spout releasing more water. My next thing to try will be a bath, so I'll let you know how he takes to it. I've attached a couple of pictures along with video proof of Leonard in the shower this morning. Leonard makes me smile and laugh everyday. I am so glad that I found him! Thank you so much for this great update, Laura. Clearly, Leonard is a happy, well-adjusted boy. We're so glad he found YOU! And speaking of Winklers, you can follow Bibi and Flip's adventures here. how fascinating that he's taken to showers like that! so nice to see the handsome boy he's grown into. From a tiny little guy to this large handsome, showering cat...amazing. He is beautiful and quite a character. Tiberius is also very handsome. What a great family!! What a handsome boy! Love the video clip of him showering - that is just so funny! He obviously has so much personality and I'm sure he charms everyone he meets. I love this. I can't even get my kids to shower every day, much less my cat. Leaping Lizards, it's Leonard the Water Cat! So nice to the babies all grown up and living happy lives. Wow--Leonard is a big boy now! I also love the video of him in the shower. Too funny! What a funny boy, great to see him. I knew cats were self-cleaning, but this takes it to another level. Excuse me, Leonard? cats don't like water! This is aberrant behavior!!! OMG, he /showers?/ That's hilarious. Also, DUDE HUGE CAT WOW. At 8 months, he's probably not done growing yet either. My big boy opens my fridge. I have managed to defeat this behavior using the platter off an old drive - it's a large, flat, strong magnet that is big enough to span both the edge of the door and the top of the fridge. I just set it on top of the fridge spanning the door and the fridge, he can't get to it and he's not strong enough to open the door with it there. I knew he was going to be a big, soft, beautiful teddy-bear of a cat and, upon reflection, I'm not surprised he so quickly decided to assert himself as big man-cat of the house. His confidence in his own big cat status was probably inflated from hanging out with Bibi, and that's what being alpha cat is all about: attitude. My theory on his new interest in showers: it appears as if he has decided that showering is a kind of game for which you do not own exclusive rights and he wants in on the action. What an absolutely adorable kitty he is and with so much personality - love love love. That is hilarious! Various cats in my life have liked to either play between the tub and shower curtain while the shower is on or play in the wet tub after the shower is turned off, but I have never had one that wanted to shower with me. What a happy, handsome cat. Leonard's baby pictures show some big paws for a kitten and it looks like he has grown into them, physically and with his big personality. He and his brother cat sound like they are two very happy, very well-loved cats. Thanks for the update! Leonard has grown into a handsome and hilarious cat. He is absolutely hilarious and still a fluff ball full of big love! Leonard is a very handsome cat. I'm very happy to learn he is doing so well. Oh, he's such a little sweetheart! His eyes are so beautiful! The showering is hilarious. Leonard is very handsome! I love his coloring around his mouth. That is just too cute! And I adore the little kitty snorts in the shower! 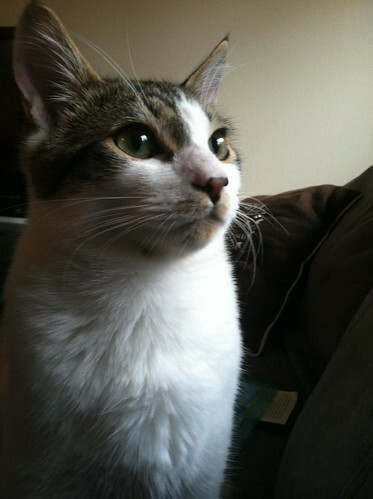 Tiberius looks like a gorgeous boy too. Leapin' Leonard! He is growing up to be a gorgeous, if a little goofy dude! What a big, cuddly, adorable nutjob of a cat!! 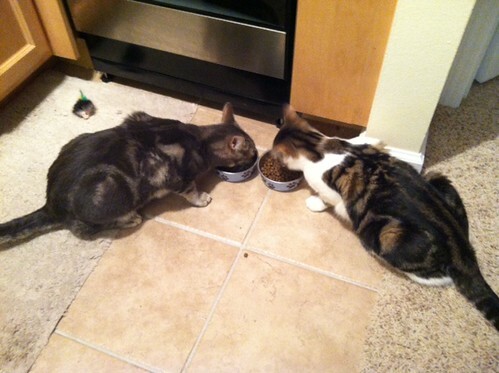 It's wonderful that he and Tiberius get along so well and he brings so much joy to his home. Terrific! 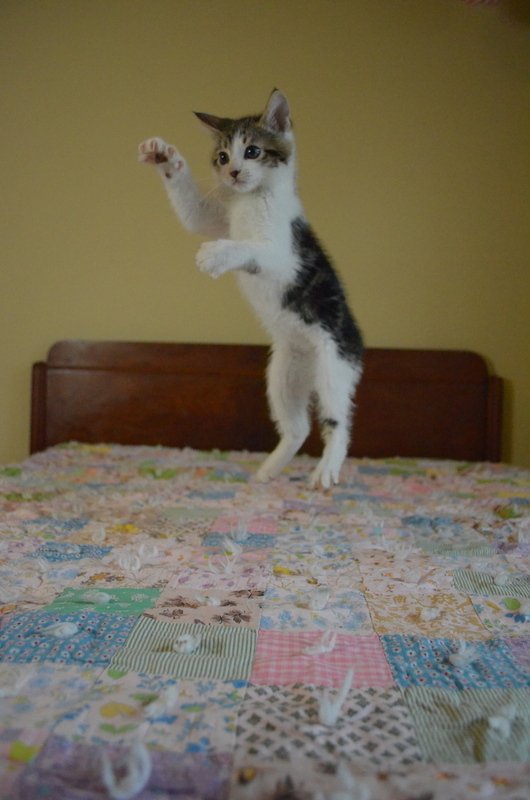 Leonard's great playful personality has been there from kittenhood. The shower scene is absolutely fabuloso! Leonard? Tiberius? Am I detecting a Star Trek theme here? Good lord that boy's a goofball!! A handsome, lovey dovey boy, but a goofball all the same. So glad he has the equally wonderful Tiberius as a big brother.